I returned by train to Bologna. I had to change trains in Milano for the Bologna bound train and was on the Freccia Rosa (red arrow). They have a screen at each end of the car that provide advertisements, mostly for their trains but also regularly shows the velocity. It’s really nice traveling in a 300 km/hr (about 186 mph). 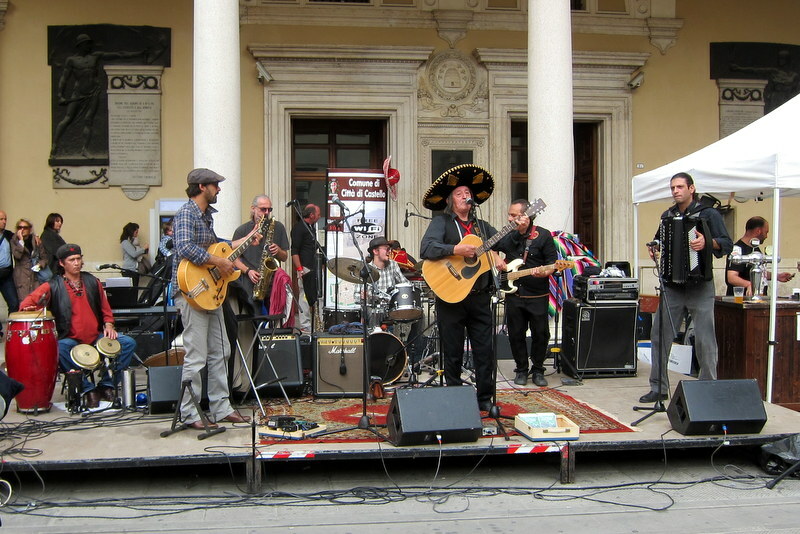 After an overnight stay in Bologna I went to airport the next day and picked up my rental car and headed south. 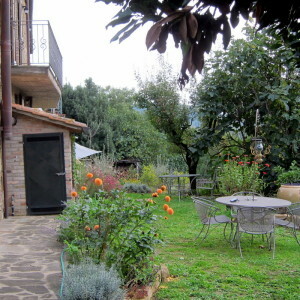 I stayed with an acquaintance, Joan, who is a retired nurse and moved from Oakland to Umbria. 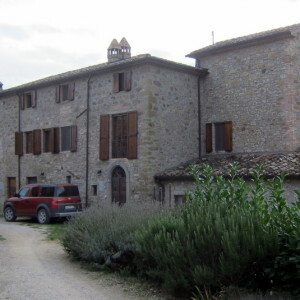 She had bought the house many years ago and restored it. It’s really a beautiful house (but I forgot to take interior pictures). For me it seems incredibly isolated. A couple of kilometers from a tiny town and there’s a dirt road that you follow for 3 or 4 kilometers to arrive at her house. I’d go nuts. In any case we went on Sunday to the only city of any size within a reasonable distance, Citta, di Castello where they had a flea market/antique fair. They were also having a chocolate festival. 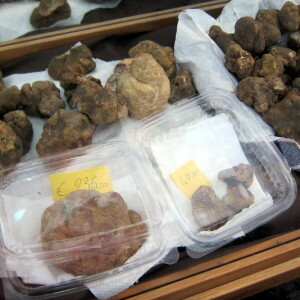 That was mildly interesting but more interesting were the truffles, both black and white that were on display. 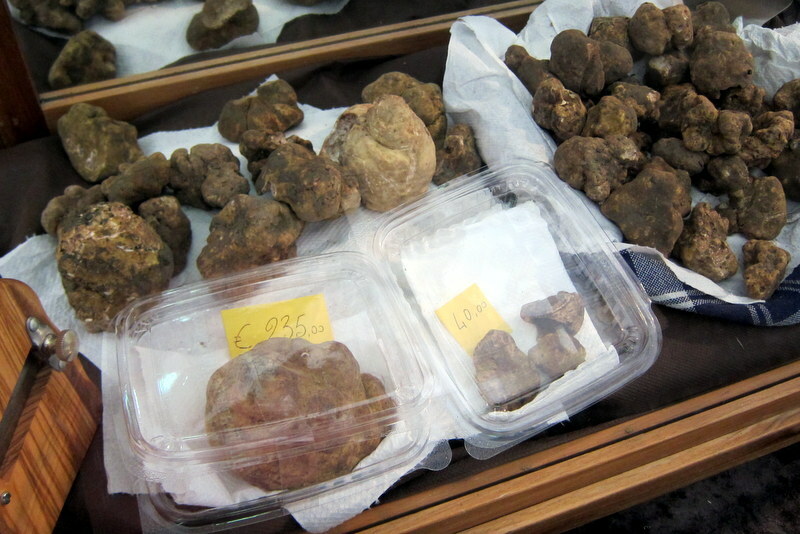 The larger white truffle in the picture is about the size of a small child’s fist and the price was 235 euros (about $300 these days). The black ones on the other hand, as you can see, were much more reasonable. Each was about the size of a large walnut. I can attest that these are also delicious. I’ve never had the white ones. There was also a monthly street fair of antiques or at least collectibles. Include were some musicians. 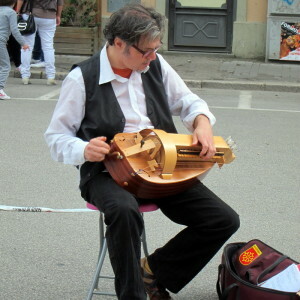 One playing a hurdy gurdy that he may have made himself. And also, believe it or not, a mariachi band. Who knows, maybe they were Italians faking it but they seemed real to me. 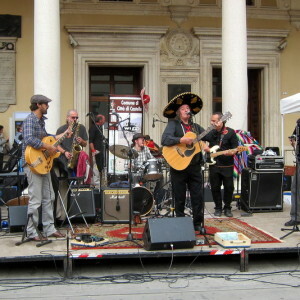 Mariachis in Citta’ di Castello? I was able to taste some salame made with truffles and was knocked out by the taste. We met some other ex-pat acquaintances there, had a coffee, walked around, and had lunch. I was the only man among the 5 or 6 women. 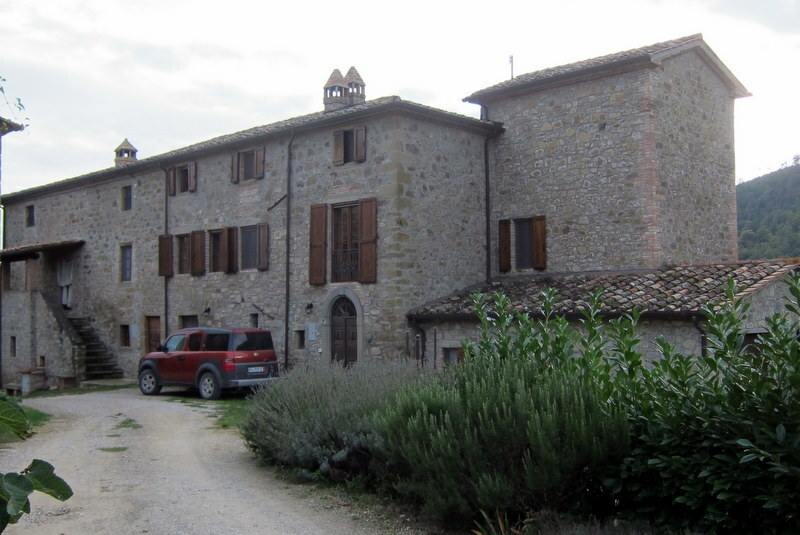 All but one of them lived there and some for several years but none of them spoke Italian as well as I did. It would seem strange to me to not learn the language of the country where I was living. It certainly limits your meaningful human contact. 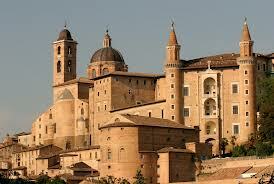 I’ll toss in Urbino here is well. After a 2 night stay at Joan’s place I headed to Urbino which describes itself as the “ideal city”. I remember reading a selection in Italian class by the famous Italian architect, Renzo Piano, who, when asked what city he thought had the best architecture, replied Urbino; so I wanted to see it. Unfortunately it was raining cats and dogs the whole day so it wasn’t a very good day for walking around or taking pictures. The one below comes from the web. I’d like to go back some time because I can see why it is highly thought of. Again the high point of the day was lunch; pappardele with a sauce of cinghiale (wild boar) and porcini mushrooms. 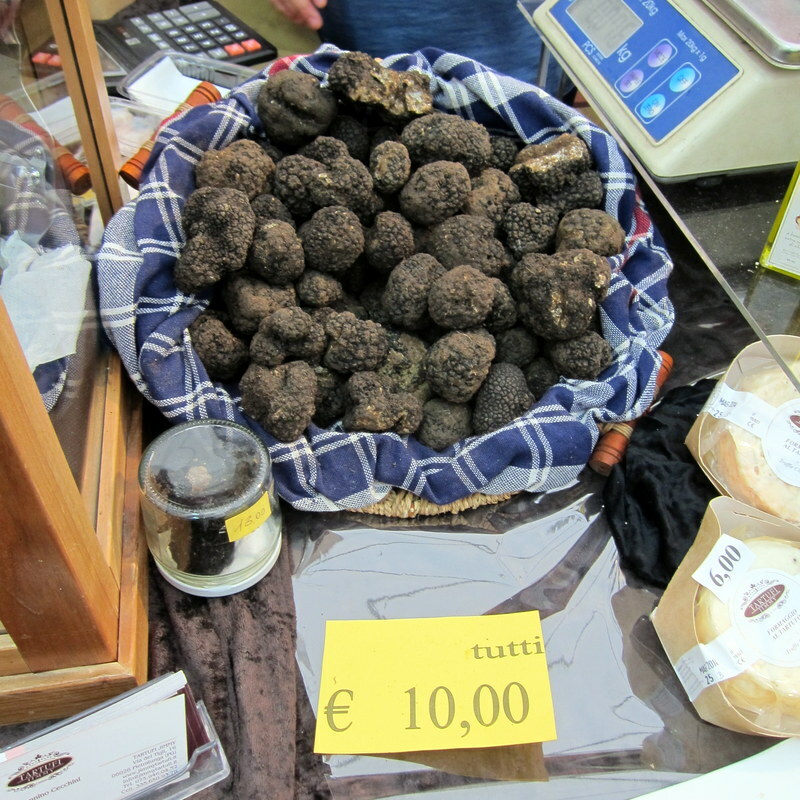 This entry was posted on Monday, October 28th, 2013 at 1:41 pm	and is filed under Culture, Food, Language, Travel. You can follow any responses to this entry through the RSS 2.0 feed. You can leave a response, or trackback from your own site.